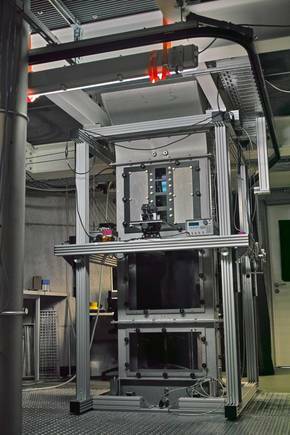 The "turbulent Leipzig Aerosol Cloud Interaction Simulator" (LACIS-T) is a multi-purpose instrument for investigating atmospherically relevant interactions between aerosol particles and cloud droplets/ice crystals under well-defined, turbulent laboratory conditions. Investigations at LACIS aim at fundamental process understanding and are complementary to field measurements. 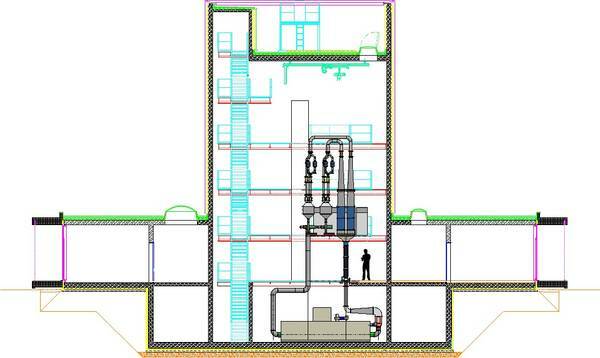 Sketch of LACIS-T in the TROPOS cloud lab building: © Schulz und Schulz Architekten GmbH; Ingenieurbüro Mathias Lippold, VDI; TROPOS. LACIS-T is a closed loop wind tunnel (Göttingen type). The air inside the channel circulates continuously with a flow rate of up to 10.000 l/min. The actual measuring section of the channel is 2 m long, 80 cm wide and 20 cm deep. Cloud formation occurs via turbulent mixing of three conditioned flows (i.e. two particle-free air streams, and one aerosol stream) brought together at the inlet of the measuring section. Turbulence is thereby generated by two passive, planar grids (currently mesh length of 19 mm, rod diameter of 5 mm and a blockage of 30%) in the particle-free air streams (approx. 5.000l/min each). The main feature is that the thermodynamic (mainly temperature (-40°C < T < 25°C) and water vapor concentration (-40°C < Td < 25°C, Td: dew point temperature)) and flow conditions of the three flows can be separately adjusted and controlled with high precision. Inside the measurement section both particle-free air streams are turbulently mixed, resulting in the combined flow becoming locally supersaturated with respect to liquid water and/or ice. In the mixing zone, aerosol particles of known size, chemical composition and number are injected between the two air flows. Due to this setup, the influence of temperature and water vapor fluctuations, and consequently saturation fluctuations onto cloud droplet activation and heterogeneous ice formation can be studied with well-known initial and boundary conditions.